I am awaiting delivery of a new item for my international collection - one of the elusive white spine PCs from the Spanish publisher Bruguera. This company did the first 6 titles in hardback with groovy 1970s DJs - those are actually more common and slightly easier to find than the later picture covers. 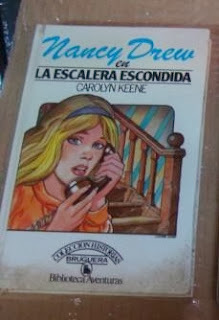 I had never even seen the cover for #2 La Escalera Escondido but knew of its existence from a library database. I also have copies of 1, 4 and 5 with the revised artwork by Felipe G. de la Rosa - I would guess that maybe there is a version of Bungalow in this set but I've never seen any evidence of it. Coincidentally I ran across the listing for this book when I was visiting Toledo OH to attend the estate auction of the daughter of Mildred Wirt Benson, the original ghostwriter for Hidden Staircase. Guess that I had some Millie juju going for me!